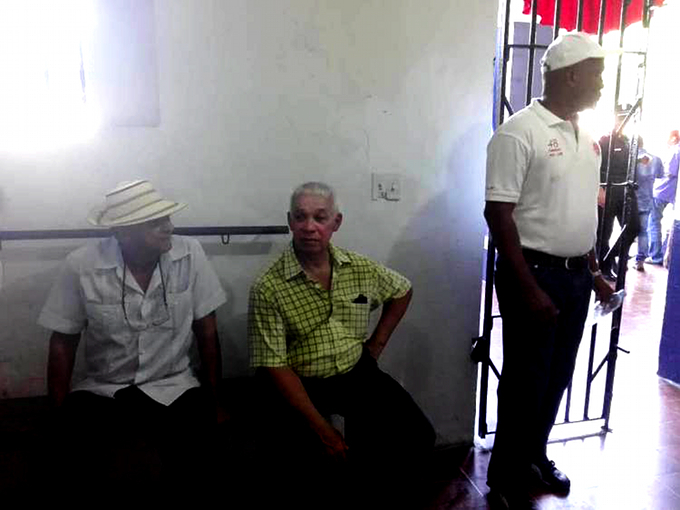 Marcelino Ruíz, in the yellow and black shirt, under arrest at the justice of the peace office in La Villa de Los Santos. Justice of the Peace Rita González fined him $300, under which section of which law is not particularly clear. Photo from the Radio Temblor website. Varela IS involved in the Odebrecht cases. The extent of it and the full legal ramifications are unknown. After first denying it, Varela belatedly admitted that his Panameñista Party received millions of dollars from the hoodlum Brazilian corporation. The first allegations of this were made by Varela’s erstwhile chief of staff and the functional administrator of the Panameñista Party, the notorious Panama Papers lawyer Ramón Fonseca Mora. Varela’s admission came months later after other witnesses said the same thing and foreign prosecutors uncovered electronic and paper trails. There has been no formal investigation of this in Panama. By Varela’s limited timeline it would appear likely that lawyers would argue that the statute of limitations has run if ever anyone brought charges. Ruíz was chased by SPI presidential guards and police to his mother’s house nearby. He was taken to the justice of the peace, who fined him $300. But all of a sudden he is a national hero to a great many Panamanians. Odebrecht? It and its executives and operatives have been found guilty of crimes and civilly liable for many acts of wrongdoing in many Latin American countries, with the central modus operandi being the overpriced public works contract awarded in a rigged contest, with kickbacks going to public officials. It is widely considered the biggest graft scandal in Latin American history. In Panama the company made a plea bargain on bribery charges that calls for a large fine to be made in structured payments over several years. Odebrecht continues to get government contracts here, with Varela making the argument that a guilty plea makes it legally impermissible to bar the company from new dealings with public entities here. Most recently a consortium of Odebrecht and FCC got the contract to extend the Metro commuter rail system to Tocumen Airport. FCC, controlled by Mexican billionaire Carlos Slim — also the biggest shareholder of The New York Times — has also pleaded guilty to criminal acts of corruption.